Showing 1 - 4 of 4 articles tagged "Blue's Clues"
According to TMZ, the Nickelodeon reboot received more than 1,000 submissions to be the new host. According to TMZ, Nickelodeon is "seriously considering" a woman in the host role. 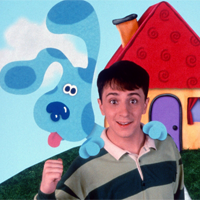 Nickelodeon is rebooting Blue's Clues with a "refreshed signature look"
The animated preschool classic is coming back with a new live-action host.